M. Night Shyamalan’s final installment into his superhero thriller series has two outstanding acts in its story that play on many expectations. Yet it all comes apart in one of the most polarizing endings that basically destroyed any chance of the film becoming great. 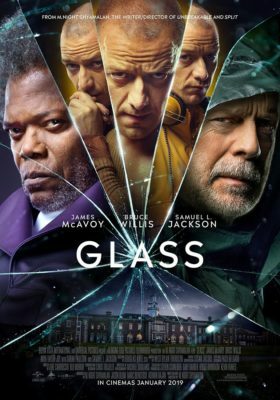 Glass is the continuation of the three paths of David Dunn, Kevin Wendell Crumb and Elijah Price after they are all put into a mental institution. The story follows them as they all struggling with their identity while Elijah, better known as Mr. Glass, tries to invoke his plan. One of the best parts about this movie is the entire performance James McAvoy, who plays Kevin, better known as The Beast. The delivery of acting with 23 different personalities and the transformations that he undergoes to indicate this is one of the most entertaining things to watch. The previous movie to this, Split, is one of the best films out there and if they had stopped with Split, it would have given his character much more justice. The third act of the film, however, is a major disappointment. The payoff has no real weight to it and the entire message that they try to convey at the end is incredibly prehistoric in today’s society. Yet the show presents itself as if it’s this grand event that changes everything. Shyamalan is known for his twists, so when this film finally got to that point, with this grand tone of a final showdown, the twist wasn’t just a major letdown for people who enjoyed these characters, it felt lazy and cliché. I can’t say this picture is bad, but it is best summed up with a fact about the two previous films in the series. Shyamalan had written Unbreakable and Split back in the 2000s when he was still an up-and-coming director. So when Split was released back in 2016 and was so good that a sequel received the go-ahead, Shyamalan had to write the new script almost 20 years after he wrote his first two movies and honestly, it shows. Glass is a very entertaining watch for people who have never seen the previous two films in this series or just would rather turn their brain off when they go to the cinema. But anyone else will feel like a disapproving mother, not mad, just really disappointed.